My October Bulu Box is on it's way and I realized I forgot to share my September Box! I have been super over-committed lately and this pace will probably just increase through the holidays so it's great I have Bulu Box to keep me going with great health, weight management and fitness products to keep me fueled for my busy life. Ƹ̵̡Ӝ̵̨̄Ʒ - KIND Healthy Grains Oat & Honey Toasted Coconut Bar - With a foundation of 5 super grains (oats, millet, quinoa, amaranth and buckwheat), gluten free oats that are sweetened with honey and toasted coconut flakes, these are chewy with a crunch! I for one love to have bars in my purse and desk, in case my public transportation commute runs into un-expected delays or I am in a rush and have to skip breakfast. Bars are always a great quick breakfast go-to for me. Ƹ̵̡Ӝ̵̨̄Ʒ - Manitoba Harvest HempPro 70 - This plant based hemp protein supplement packs 14g of protein, 2.7 g OMEGA 3 and 6, is water soluble and mixes easily into any drink or you can stir it into yogurt or hot cereal! As it has all essential amino acids it's a great complement to any vegan or vegetarian diet! Smoothie anyone? Ƹ̵̡Ӝ̵̨̄Ʒ - NuHair For Women Styling Foam - A styling foam with a Natural Peptide Complex that can defend against hair follicle damage and graying hair, nourish hair follicles for fuller more beautiful hair and energize the hair follicles for healthy hair growth as well as revitalize hair texture to add shine? YES, PLEASE!!! Don't hate but I don't have Gray hair so I can't speak to whether or not that part is true because I don't have them, but I do have naturally thin hair so I love trying out thickeners and the foam application is truly easy, this product has no sulfates, parabens, petrolatum, mineral oil or phthalates but it does have Shea Butter, Grape Seed Extract, Chamomile, Sage, and Rosemary and is a DHT inhibtitor. As both men and women age their levels of DHT increase, and increased DHT levels lead to hair loss or thinning hair. As I use it longer I will report back on how well it works for thinning. Ƹ̵̡Ӝ̵̨̄Ʒ - Powbab Superfruit Chews - Powbab immunity boosting superfruit chews contain Baobab fruit pulp which is high in anti-oxidants (more so in fact than pomegranate, blueberry, acai, and cranberry!) and they are high in Vitamin C (more Vitamin C than kiwi, strawberry, orange or grapefruit) and contains 12 minerals and vitamins. This chew actually combines pomegranate and acai berry with Boabab - giving you a 'superfood' in a super portable chew. Again I love having immunity boosters in my bag or desk so I don't forget to do something good for myself each and everyday! Ƹ̵̡Ӝ̵̨̄Ʒ - ClearLungs Chest Rub - All natural blend of aromatic oils and Chinese herbs to help sooth coughs and colds, relieve congestion and breath easier! It can also be used on muscles and joints to relieve minor aches and pain, Ridgecrest Chest Rub has been the #1 natural lung health product in the United States for almost 16 years. With winter swiftly approaching here in the North East I am going to need to stock up on this for sure! Ƹ̵̡Ӝ̵̨̄Ʒ - Swirl Tea - Iced Green Tea in just 10 minutes with convenient stick packs that you just drop into a cold water bottle. Made with premium quality all natural green tea leaves and has no preservatives or artificial additives. Green Tea is a natural source of antioxidants and helps to combat free radicals which helps revitalize the body on a cellular level. (10 minutes for a light brew and 30 for a full-bodied flavor) - and did I tell you there is NO calories or sugar! This was an excellent box and I am looking forward to seeing how the styling foam works for me over time! Wow I haven't heard of this box before! It looks really wonderful though. I want to look into more boxes, sadly they don't send many to Canada. I will see about this one! I have never heard of this box before. Love the unique products that it has added. This looks like an awesome subscription box. I love how healthy everything is in it. KIND bars are my favorite! Tea! I always get excited when I see boxes that contain tea because they are usually a brand I have never heard of and want to check out! 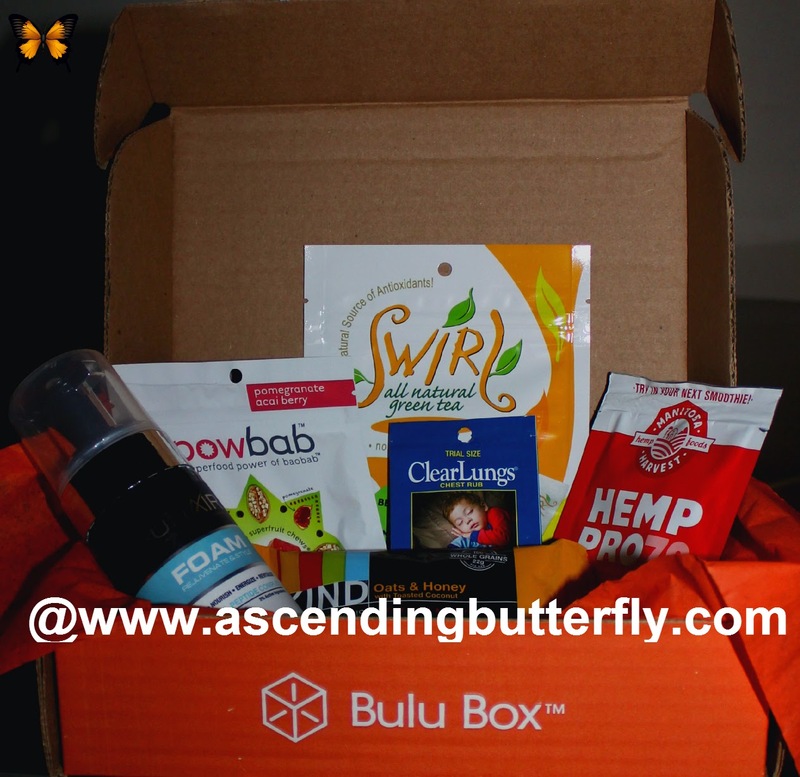 Love the BULU Box review. Kind bars are our favorites! I'll have to check into this more. I can think of several gift ideas with this one! I love sub boxes! Thanks for sharing these looks like fun items! I have never tried a Bulu Box before. I do love the contents you have featured here so maybe I should try one. This is a great time for this Bulu box ,I know I can always use products that can keep me as healthy as possible, as always thank you for bring us new things to try !! The superfruit chews look interested, I would love to try some. Have not heard of this subscription service before, but will be looking into it. Thanks for sharing..I like this concept. I've never heard of this box before. I swear, I think there is a box for everyone and every interest. Subscription boxes are so much fun to look forward to. I don't think I have heard of this subscription box. It is fun to get a surprise box. I always love boxes like this! This is the first health and fitness one I have seen and it looks great! What a fun box of items, I haven't heard of any of these items before so I thank you for sharing them. I will have to go peek now to see which items I may try! Kind Bars are a favorite. What a treat to get an assortment of good things in one box.